"... channeling Bryan Ferry with Spike Jones as music director ..."
"... The King, on bad acid..."
VELVETEEN BLUE "Live" at the prestigious FIRE FLY Jazz Club in Ann Arbor, fall 2003. This page covers the whole comic lounge phenomena which Laurence traveled on and off for over 12 years. 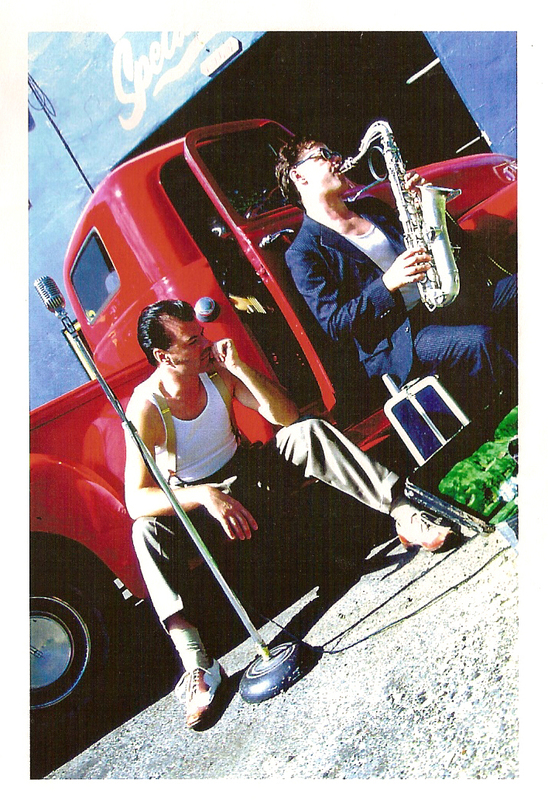 VELVETEEN BLUE, the final stop, formed in 2003 as an odd mix of an "over the top romantic sentiment" mixed with "bastardized existential comedy". This was his eventual answer to the now defunct retro lounge music resurgence of the 1990's. 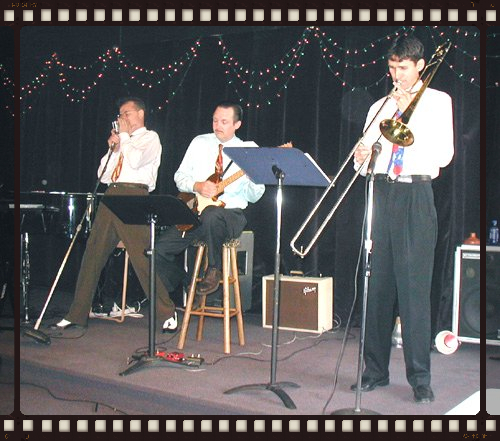 As a trio, VELVETEEN BLUE performed against original backing tracks, coming off as a surreal, shlock-pop jazz sextet. It's precursor, MEZZANINE, started it all back when the retro lounge style was so popular in the mid 90's. (More information on this band found at the bottom of this page.) As a five piece their claim to fame was opening up for LARYNX ZILLION'S NOVELTY SHOP, in 1994, at Ann Arbor's Blind Pig. Who would have thunk? 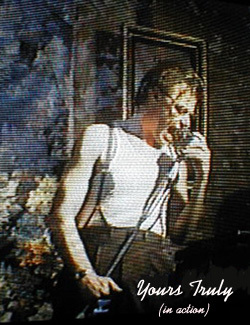 VELVETEEN BLUE, after playing the prestigious Fire Fly Club in Ann Arbor in 2003, went into the studio to record a quality demo for actual gigging purposes. Without seeing this bloom into full fruition, the band quickly faded into an existential comedy shtick duo with just Laurence and Brian Delaney. This version was not unlike what he was trying to do with twin brother Benjamin Miller in the late 90's. This didn't last. It all started back in 1993, while Laurence was cutting the back-40. Moronic Elvis interpretations would come to mind with absolute screw ball demos ensuing shortly, thereafter. Songs like "Knock First, My Love", "Gentleman of Honor", and "Can't Crap For Nothin". By 1994 he'd written a few half-serious numbers and quickly formed an actual group with current members from his band LARYNX ZILLION'S NOVELTY SHOP. 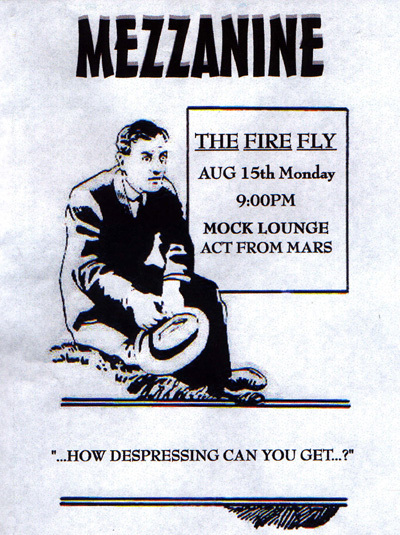 Laurence called this mock lounge act, MEZZANINE". MEZZANINE recorded a few original numbers in the studio, and opened up for LARYNX ZILLION'S NOVELTY SHOP at the Blind Pig where they sported a haunting version of David Lynch's MYSTERY OF LOVE from the film Blue Velvet. The band began playing out at Ann Arbor's coffee shop, THE GYPSY CAFE, from 1995 thru 1996 with mixed results. Very few seemed to have any idea we were "trying to be like that" so, as LARYNX ZILLION'S NOVELTY SHOP folded in 1997, so did MEZZANINE." Laurence eventually gathered professional experience under his belt, crooning lead for David Swain's II-V-I Jazz Orchestra. Playing the Hiedleburg, Clutch Cargo's, weddings and special events spurred his interest on. Miller tried resurrecting MEZZANINE again, this time as a duo with twin brother, Benjamin Miller, calling themselves THE SUICIDE DOORS. They fancied the idea of taking the comedy route, seriously. Home videos were shot and song lists grew but sadly their take on it all would have been too whacked for the public at large. Though Laurence and Ben considered cleaning up their act and going pro, it was clearly impossible. They were that good. Suddenly, in 2003, Miller resurrected the whole concept yet once again, this time calling it VELVETEEN BLUE inspired by David Lynch's film Blue Velvet. "The scary thing is that I took it seriously this time." says Miller. Hiring local guitarist Brian Delaney (B Deluxe) from THE ROYALLE GARDEN TRIO and digging up the original trombonist for LARYNX ZILLION'S NOVELTY SHOP, Erik Beurnrighter (Sliced Holmes), Miller hoped to put together something viable. His idea was to perform along to various old and new backing tracks as a surreal shlock pop jazz trio. Amazingly enough, VELVETEEN BLUE managed to snag a gig at the prestigious jazz club THE FIRE FLY, get hired for birthday parties, book themselves in at Dreamland Theatre, and shoot a community television music video collection, "Shoot The Piano Man". 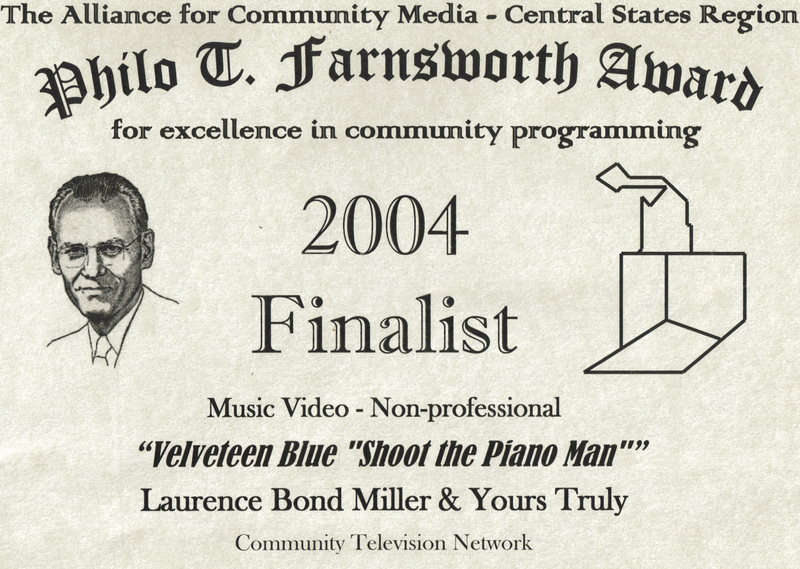 This video production won Finalist Award at 2004 Philo T. Farnsworth Festival. 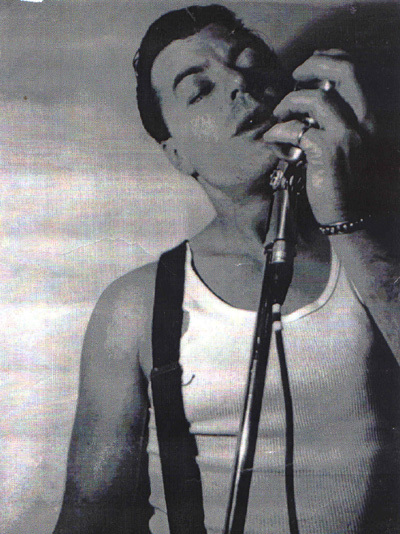 Shortly thereafter, VELVETEEN BLUE went into Brian's studio to record a pro-demo for "straight" gigging purposes. However, having lost their trombonist by that point, VELVETEEN BLUE was destined to quickly devolve from there (much like it's predecessors) into an existential comic routine. Brian Delaney as B Deluxe and Laurence Miller as Yours Truly continued on a couple more gigs that year at Dreamland Theatre, dragging their mind numbing performance art into the mix. No one seemed to understand nor appreciate the sheer beauty of their collective madness. Little Surprise. Example 2: In the spacial mid section to their original arrangement of Twilight Time by The Platters, B. Deluxe would suddenly sit down on a stool and pretend to roast weenies over a fire pit, while Miller played a suspended, surreal dream-scape on the keyboard. Who would have thunk? VELVETEEN BLUE , now struggling as a studio only duo, Laurence and Brian dubbed their parts on the bulk of their backing tracks for their first CD. This was comprised mostly of originals, but never saw the light of day. Laurence and Brian eventually gave up the ghost entirely, sometime in 2005. The band never completed the CD release and as a performing act has not been seen since. 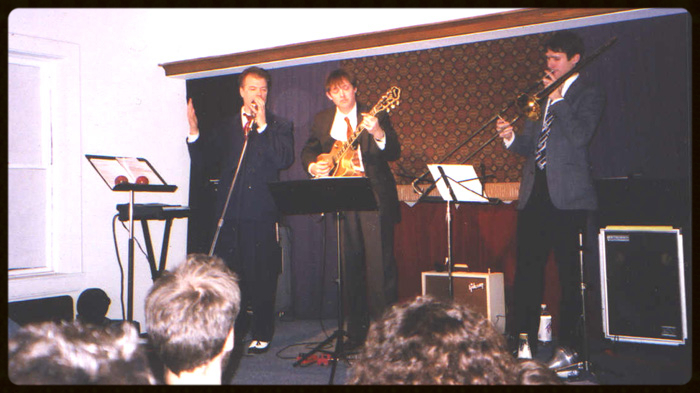 VELVETEEN BLUE "Live" at DREAMLAND THEATRE New Year's Eve, 2003. (Morty Nevins, Al Nevins and Artie Dunn). on bad acid, under the direction of David Lynch..."
Yes, it's true. 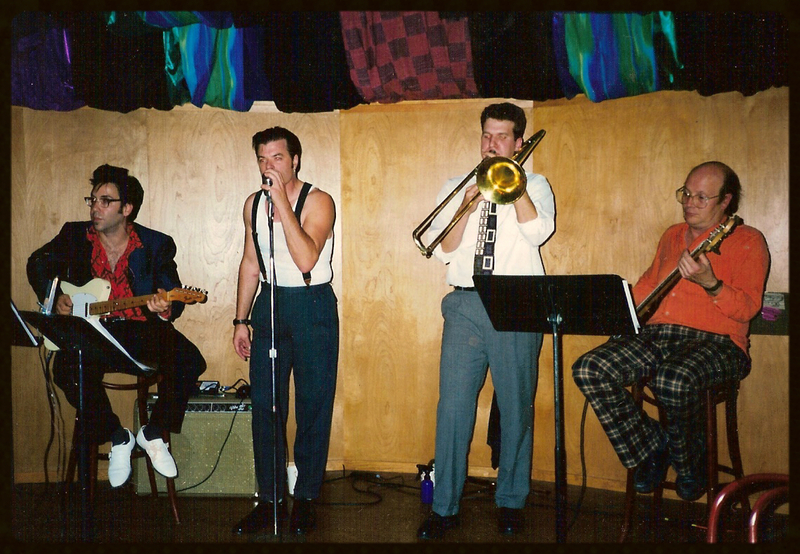 Other than our drummer, this band was essentially THE NOVELTY SHOP, charading as a 50's throw back loung act. God help us all. A mock poster Laurence drew up, back in the day. Though Ben and I did start out as "pure comic chaos" in the finest sense, The Suicide Doors did eventually move into a more forward leaning, professional disposition. Check the pic below. Too bad this trend didn't do us any good, so we shut our fingers in the door. THE SWING KIDS, during gorilla street performances at the Ann Arbor Art Fair. for them, singing accapella like the bullheaded buffoon that I am." KISS ME, PLEASE KISS ME (Please, kiss me, please?) and BY INVITATION ONLY. 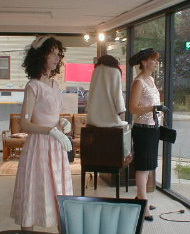 of SARAH'S ATTIC, on 10/21/00, a long since defunct vintage retail store in Ann Arbor. Dig them reflections in the window, man. This was a semi regular happening on football Saturdays, in the fall of 1999 thru 2000. YOURS TRULY would sing along to the original tracks from his band's demos, pumped out into the street, while standing in the presense of "live" manikins. "We called ourselves The HuManiquins. I can't tell you how much fun that was. Passerbys would literally freak, not knowing if we were real or not. And, I've got video footage to prove it. 'Look! He moved!' ...oh, please"
The Humaniquins in action at Sarah's Attic. ""Standing around on the job"